The husband/wife team at Golden Dragon Thousand OaksExecutive coach Scott Leese of Dynamic Coaching Strategies and his kids recently visited the newly opened Golden Dragon Chinese Cuisine at 2416 E. Thousand Oaks Boulevard, Thousand Oaks. Husband and wife team Young and Ng decided to open this restaurant next to Harold's House of Omelettes and across the street from Toyota of Thousand Oaks in this clean, well lighted location. 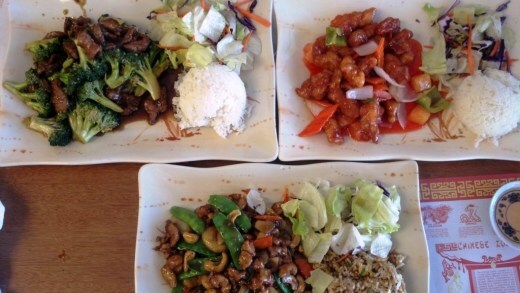 Scott and family were excited with the large portions and notably fresh ingredients with their lunch orders of Cashew Chicken, Beef and Broccoli and Sweet and Sour Chicken. He also noted that the cheese wontons were "amazing" and a must order! Lunch specials were reasonably priced in the $6.95 to $7.95 range. Their phone number is 805.379.8858.